I am on vacation at the beach this weeks so I am posting some older reviews of books that make great beach reads. 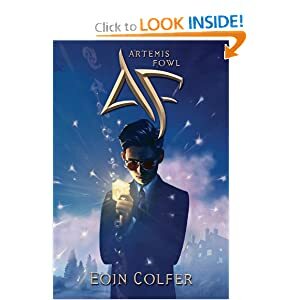 I finished the last Artemis Fowl book this week and will post the review next week. I did not read these when they first came out. I am glad that the series is almost done. It is easier to read that way. Artemis Fowl is a 12 year old genius. He also happens to be from a very long line of thieves. Previous to the book, his father went missing (died?) and as we meet Artemis he is leading the household with the help of his assistant Butler. His mother is grieving over his father’s loss and has had a break with reality. She often does not even know who Artemis (or anyone else is). Butler’s sister is his mother’s maid and caretaker. Artemis wants to do a really big job to regain the family fortune and status and maybe find his father. He finds a way when he discovers that Leprechauns are real and devises a way to steal some of their gold through a kidnapping and ransom. This is a very clever mixing of technology and magic. It has the feel of James Bond crossed with Richie Rich with a bit of modern magic. I keep hearing it compared to Harry Potter, but that is not the right type of magic or the right feel to the books. More of the feel of a modern version of The Great Brain, but as a super rich thief. Again, I found these as downloadable audiobooks from my library. I am mixing these lighter young adult novels because I am also working through two different over 800 page theology books. There has to be some balance in reading materials.